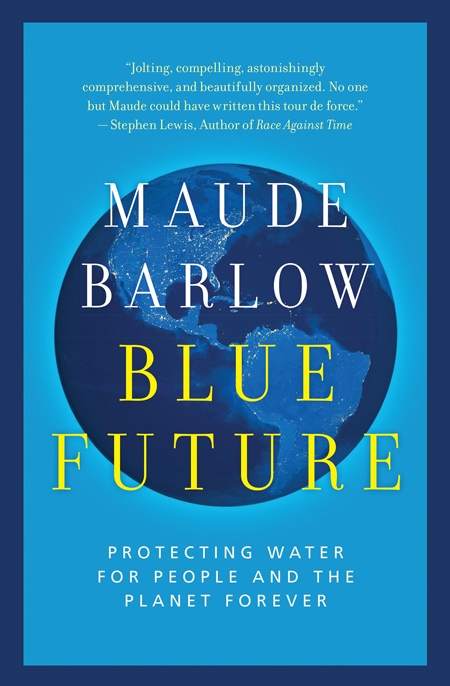 Published in late 2013, Blue Future is the latest in a series that includes Blue Gold (2002) and Blue Covenant (2007) by Canadian water-activist and former UN General Assembly President advisor (2008/09) Maude Barlow. For over two decades, Maude has been working to raise awareness about the global water crisis and was a prominent leader in the campaign to recognize access to water and sanitation as a human right that led to its adoption by the United Nations General Assembly on July 28, 2010, with the acknowledgement that access to water and sanitation are essential to the realization of all human rights. Despite this victory for the water justice movement, the crisis is worsening. According to UN figures some 800 million people lack access to clean water and 2.5 billion people do not have access to a toilet. By 2025, it is expected that two-thirds of the world population will be living under water stressed conditions, a situation that is exacerbated by climate change, disruptions in the water cycle and increasingly devastating extreme weather events. 1) The implementation and fulfillment of the Human Right to Water and Sanitation represents a fundamental obligation for governments across the world to fulfill. This is not a question of charity or CSR. 2) Water resources must be protect, conserved and managed as a “common” that belongs to everyone and for the benefit of all – including future generations. 3) Water is an essential element to allow life on earth and biodiversity to flourish and is essential to ensure the health and resilience of the ecosystems. Our failure to properly manage watersheds and water resources undermines the prospects for human development and progress. Economic development policies must recognize these fundamental laws of nature. 4) Increased water stress can increase tensions, disputes and conflicts over access to scarce water resources. But they can also become a source of cooperation as communities search for solutions for sustainable ways of producing energy and food. Blue Future provides an urgent call for action to address the crisis of poor water management around the world. Modern agriculture is a case in point: it is responsible for 70% to 90% of global water withdrawals for mass-irrigation that are siphoning aquifers, rivers and lakes. Water “mining” is lowering water tables and drying up rivers around the world. The drying up of the American Ogallala aquifer would destroy $20 billion worth of annual agricultural revenue and turn the region into a giant desert. Withdrawals from rivers by large-scale farming operations reduce water flows to the point that some of the world’s largest watercourses like the Yellow River (China), the Colorado and Rio Grande (USA), or the Murray and Darling Rivers (Australia) no longer reach the sea. The book also provides an fascinating account of the water-energy nexus and the growing impact of our energy policies on water resources, including the consequences of dams for electricity production, the pollution of water from coal powered electricity production, the impact of biofuels, tar sands, fracking, nuclear energy but also from renewable energy – namely large scale solar thermal plants that use water for cooling. By far the largest impacts are caused by coal power plants and biofuels. Ironically, some of the largest coal plants are located in regions that are on the frontline of the water crisis with China accounting for 50% of world production. Biofuels not only represent a threat to food security, they also carry an unfavorable carbon footprint versus fossil fuels and a massive water footprint. Instead of being a response to climate change, corn ethanol represents a threat multiplier that contributes to soil pollution and causes greater water scarcity. Blue Future is ultimately a book of hope. The development of large-scale drip irrigation can reduce water needs by up to 90% and requires a fraction of the energy to operate. Ancient and highly effective solutions like rainwater harvesting can be deployed on a large scale to reduce pressure on aquifers and rivers and compares favorably to the modern practice of water mining. Local, organic and sustainable farming practices can reduce water requirements, improve food security and provide livelihoods. Most importantly Maude Barlow demonstrates that solutions are available. What is missing is the public awareness and the pressure on governments and authorities that will bring about the political will to necessary for their deployment. This story is far from over! For more about Maude Barlow and her work see the Council for Canadians website. This entry was posted in Book Review, Uncategorized and tagged maude barlow, Right to water and sanitaiton, water crisis by adamkoniuszewski. Bookmark the permalink.